Well, it seems that it is that time of year again! The week of September the 9th is quickly approaching and that means it's time for Coldwell Banker's 7th Annual Ride the Range Charity Fundraiser. We'll be traveling over 220 miles (on bikes) in 3 days as we ride from Colorado Springs to Denver to the mountain communities of Evergreen and Genesee, on to Boulder then Longmont, Fort Collins, Westminster with a strong finish into downtown Denver. During the tour we will visit all all of our 14 Colorado sales offices and, at each stop, we'll be presenting checks to some of the area’s most deserving non-profits. As you can imagine, it’s a challenging but VERY rewarding event and it wouldn't be possible without your support! Many of you know that my Mom, Ann Mygatt was diagnosed with Parkinson's Disease over 20 years ago. I recently made the decision to contribute all of the money that I raise during this year’s ride to The Davis Phinney Foundation in her honor! The Phinney Foundation is unique for two reasons; they have a significant, local cycling heritage and they focus on funding programs that assist people LIVING with Parkinson's, increasing their quality of life. "The Foundation provides essential information, practical tools and inspiration to people living with Parkinson's and funds research closely aligned with our mission - improving the lives of people living with Parkinson's". 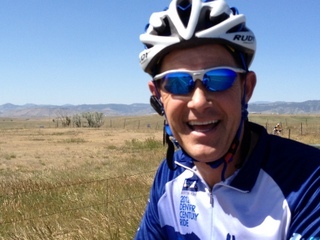 For more information visit their website at www.davisphinneyfoundation.org. Every penny you give to our Foundation through this website (or any checks you write) will be forward directly on to the Davis Phinney Foundation. Ann is doing great! She has always stayed on the leading edge of research and innovation when it comes to this debilitating disease. She's been a part of most all medical and surgical test groups and has always remained optimistic about her future and "present"! She doesn't miss a beat. I really don't know how she does it all... But I sure am proud of her!!! Please take a moment and visit the ride at www.cbridetherange.com From this site you can follow our daily adventures; we'll be posting photos and video daily. Anonymous 9/2/2013 $200.00 Go, Chris, go! Bruce Erley 9/2/2013 $100.00 Good luck with the ride! David Anderson 9/2/2013 $100.00 Great cause! Good luck! Jeff & Amy Raval 9/3/2013 $100.00 Ride like the wind, Chris!!! Brian Mygatt 9/3/2013 $100.00 Enjoy that ride! See you at the end of day one!! Greg & Jeff Bacheller 9/3/2013 $250.00 Your RPM Colorado Team is pulling for you, Chris! Have a great ride! Nancy Tan 9/4/2013 $100.00 Enjoy the Ride! Arthur Aughey 9/4/2013 $50.00 Ride like the wind! Pieter Van Ede 9/4/2013 $100.00 Chris, ik ga er vanuit dat je als de bliksem fietst! Kep Winters 9/4/2013 $100.00 Good Luck Chris! Kay and Paul Bierbaum 9/4/2013 $100.00 Ride On Chris! Love to your mom. Bob Deresz 9/4/2013 $100.00 Ride Safe! Roy Kline 9/4/2013 $100.00 Go Chris !!! Marijane Mercer 9/5/2013 $50.00 What do you tell yourself when the going gets rough? Carolyn Lake 9/5/2013 $50.00 Go Chris! You're the greatest! Dave Bauman 9/6/2013 $100.00 Go Chris! Beat Todd!! Scott Becker 9/7/2013 $50.00 Good luck - Enjoy the ride! Betsy Wright 9/8/2013 $100.00 Jody and I say "go Chris!" Monty Smith 9/8/2013 $50.00 Go get 'em Chris! Heather Ryan 9/8/2013 $50.00 Go Chris! Anonymous 9/9/2013 $50.00 Have a great ride! Anonymous 9/9/2013 In gratitude to your mom (the amount is symbolic for "life"
Anonymous 9/10/2013 $25.00 Go Chris go!! Allison Lake 9/10/2013 $50.00 Goooooo, Chris!! charles turner 9/10/2013 $50.00 Happy to contibute; I just lost a cousin to this very difficult disease so I'm gratified to assist in a small way. Joan Nagel 9/10/2013 $25.00 Way to go, Chris! Way to go, Ann!